ALL STAINLESS STEEL Header, Midpipe, and Super-Q Exhaust! COMPLETE Plug and Play MX5 Miata Exhaust Combo! Includes: Made In America All Stainless Steel Lifetime Warranty! *Both Plug and Play O2 Extension cables- needed to relocate both factory O2 sensors to the Midpipe. Simple Bolt on for MANUAL TRANSMISSION ONLY, can be installed on Automatic but see page four of our forum header install thread for details of what is required. See Extensive additional information in the product listings for each of these items elsewhere on our MX5 exhaust page, including dyno and video links (sample video bottom of this page! ), just short summaries below. Entire system saves 25 pounds over stock and adds torque from low rpms to redline that you can feel. RoadsterSport Max Power Header! Gorgeous all T304 polished stainless steel max flow MX5 Miata header. Lifetime warranty. We have included a number of features into our MX5 Miata header which we believe customers will appreciate. We CNC machine the main flange to match the factory unit, including the bolt hole flange area thicknesses so that we are precisely replicating the factory fit to the head in terms of thread depth and space, etc. We also put incredible effort into making the exit at the collector as smooth and perfect as we can get it because this collection point is the KEY to good header flow and we had to make sure this was done as perfect as possible. Note we use the factory collector gasket....so our fit is as factory-like as possible. Note that we have no O2 sensor connection in our header....in part to keep flow as clean as we can get it, but also because we could see no purpose in locating them in the header since doing so will throw a code because pulling the factory header includes removal of the first catalytic converter (code is avoided by using our included extension cables shown in the picture to locate sensors to before and after our midpipe converter). RoadsterSport Stainless Steel Midpipe. All stainless steel construction for years of driving pleasure. This MX5 Miata midpipe is slightly larger diameter than stock at 2.5 inches all the way through. Uses high quality SPUN catalytic converter with metal core (despite presence of converter this unit is not CARB approved). Uses monster 18 inch resonator because when you uncork this NC MX5 Miata motor it wants to get loud unless you use a resonator this large (by comparison stock resonator is about a foot long). Stock midpipe is 20 pounds, our midpipe is 16.5 pounds for total savings of 3.5 pounds. Despite very large resonator, this midpipe will raise the final sound level just sightly because of the higher flow larger diameter tubing. Our midpipe is designed to take both O2 sensors...and includes two O2 sensor connections...one before the midpipe's converter and one after the midpipe's converter to help avoid a code by simulating the factory installation before. CARB NOTICE: Installing a header in the NC generation Miata means removing the first catalytic converter which means there can NEVER be a street legal header for this vehicle. Thus, the header is legal for offroad race use only, and can NEVER be CARB approved. Sorry, we cannot ship these to residents of California. RoadsterSport "Super-Q" Stainless Steel Premium Adjustable Sound MX5 Miata Exhaust. Our Best! We make Five different Miata exhaust choices for the 2006 and newer MX5 Miata, including the RoadsterSport RACE, RoadsterSport STREET Single, the RoadsterSport II Duals, the RoadsterSport Q, and this premium duals unit we affectionately call the RoadsterSport Super-Q. This attenuation chamber design unit is the most mild and mellow on an otherwise stock Miata...about 10 to 15% louder than stock...with a deep burble. This unit was designed for both improved flow performance AND the best sound absorbing ability possible. 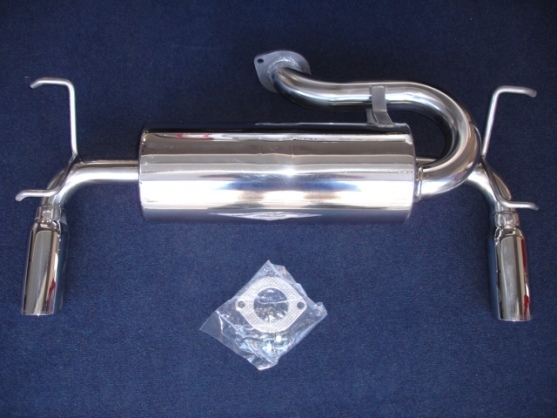 This premium MX5 muffler is the BEST choice for those who plan such additional mods as a supercharger or header change (which unleashes a massive amount of additional sound). This attenuation design is also a premium "NO-DRONE" choice for those with the AUTOMATIC transmission which tends to keep the RPMS in the lower ranges. By using smooth mandrel bent 2.5 inch tubing to redirect the flow for a side entrance to the muffler we engineered a sound wave attenuation first chamber to knock down volume level dramatically while maintaining a flow-through design. Our latest and best dyno results for the header change which are in our forum were obtained with this muffler....ALL THE FLOW, without the noise! Yes, simple BOLT ON that bolts to our midpipe, or the factory midpipe, or our Racing Beat midpipes. Weight is 24 pounds. MUFFLER installation hints and notes in our forum Installation Instruction Section! --- CLICK HERE TO READ MORE. MIDPIPE installation hints and notes in our forum Installation Instruction Section! --- CLICK HERE TO READ MORE. HEADER installation hints and notes in our forum Installation Instruction Section! --- CLICK HERE TO READ MORE. SOUND Files and DYNO at our Exhaust Blog---CLICK HERE TO LISTEN AND READ MORE. MAY 2012 Update: New Tip Design! Had many requests for a new thicker rolled tip. The problem with the rolled tips that all our competitors use is that they are very heavy, which helps partially explain the ugly fact our competitors don't want to admit...which is that most our competition is HEAVIER than the stock muffler. As a famous racer once said, weight is the enemy, and making a muffler that is heavier than stock and calling it a 'performance' muffler is not our style here. So, it took a big investment in new equipment to come up with a rolled tip that didn't add weight to our best performance design. Yes, still works with, and includes, our unique removeable baffles that put YOU in control over final sound levels. Take a ride in our 2006 with this full RoadsterSport Header, Midpipe and Exhaust. Read full installation hints and notes in our forum Installation Instruction Section! The secret is LUBE your hangers well with dishsoap so you can get flanges aligned properly, and torque the supplied hardware to NO MORE THAN 25-30 ft/lbs (using more torque will actually result in LESS seal because you will pucker the flange out at the middle). DYNO from our own Project 2006. Red line is best STOCK result. Blue line is best result with this RoadsterSport Max Power Header, RoadsterSport Midpipe and RoadsterSport exhaust...plus our MotoEast tune to raise the redline (intake is still STOCK). Notice lots MORE power from idle to Redline, lots more TORQUE from idle to redline, making the car much faster and more fun to drive!